Soak rajma for about 7-8 hours. Pressure cook for 5 whistles. You can even use ready made beans. Take kadai/pan and heat butter. Add onions, garlic paste and sauté it for about 2 minutes. Add capsicum, salt, pepper, tomato puree and cook it for about 1 more minute. Add beans and cook it for about 1 minute. 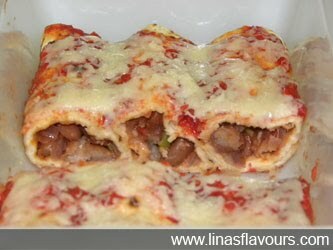 Take 1 tortila, apply 2-3 teaspoons of beans mixture, sprinkle some cheese and roll it. Take microwave safe tray. Arrange the roll seam side down. Prepare all the rolls and arrange it side by side in the tray. Pour tomato sauce on all the rolls. Sprinkle oregano and remaining grated cheese. Bake the rolls in the oven at 180 degree C for 10 minutes, till the cheese melts.